This watch makes a very practical christening gift for any little boy. 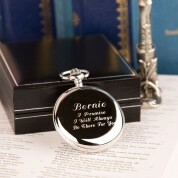 It is a lovely keepsake gift that can be given from a godparent or his godparents. He can display it in his bedroom until he is old enough to tell the time and use it at special events. 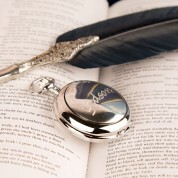 He will always remember the important role his godparent(s) played in his young life when he carries this special gift. 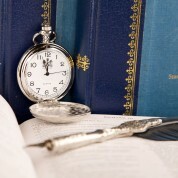 The pocket watch has a chain so it can be attached to his inside pocket and he will not lose it. 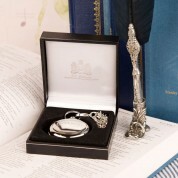 It is well presented in a gift box so can be stored away safely when not in use. Approx 4.5cm x 4.5cm x 1cm depth.